It’s safe to say, 2018 went according to plan for Anthony Rocco Martin. After making the decision to move up to welterweight and start training at American Top Team, the 29-year-old went a perfect 3-0 in the octagon last year. The result was a new UFC contract and a ton of momentum. The next step this year is making that jump into the Top 15 and emerging as a contender. 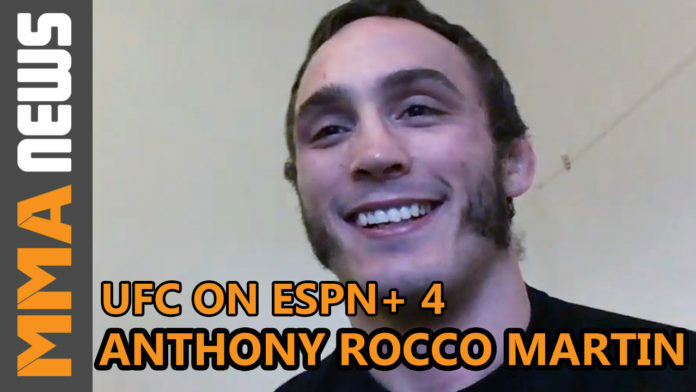 That’s why “Rocco” was unhappy when the UFC matched him up with Sergio Moraes at UFC on ESPN+ 4. Martin (15-4) has gone on an underrated run in the UFC the last three years amassing a 6-1 record. This after starting his UFC career 1-3 and was nearly released from the promotion in 2016. The change to American Top Team has been a positive one and one of the key aspects is the amount of high-level fighters he gets to work with on a daily basis. One of the major topics in MMA has been his ATT teammate Colby Covington being denied a title fight against Tyron Woodley at UFC 235 next month. While Covington is controversial to say the least, Martin supports his teammate and doesn’t think it was right that Kamaru Usman was given the welterweight title fight over him. Heading into March 9 on a three-fight win streak, Martin feels this won’t be a competitive matchup. He’s expecting another finish with the goal of landing a notable opponent in his next bout. UFC on ESPN+ 4 takes place March 9 at INTRUST Bank Arena. Former UFC heavyweight champion Junior Dos Santos faces Derrick Lewis in the main event.